What is the “Radical Middle”? It’s really very simple. It’s where the Word intertwines with the Spirit and the kingdom of God is released. It’s where His love and power transform our lives and the lives around us! The Word and the Spirit cannot be separated. You may have heard this theory before: too much Word and we dry up, too much Spirit and we blow up. However, when we allow the the Word and the Spirit to work in unity together, we grow up. This then describes the radical middle. It’s really the balance of being able to walk in the supernatural and carry the presence of God as a lifestyle wherever we go. Whichever way we look at it, as believers, our purpose on this earth is to demonstrate what Jesus and His disciples modeled in Matt. 28:18-29; Matt. 10:7-8, which is the Great Commission. It does not matter too greatly what jobs we have and sometimes what the purpose is for our lives (even though this is important); what truly matters is our own intimate relationship with God and then to do the greater works (Jn. 14:12) that Jesus did! These can only be revealed through complete humility and knowing that we can do nothing unless we allow the Father and Jesus to work in unity with the Holy Spirit through us. Living in this balance, or the radical middle, is totally biblical. We here at Roots and Wings would like to just spend a moment elaborating on the importance of this. In most instances in Scripture, and especially in the New Testament, it is clearly recognized that the Word and Spirit are One. They cannot be separated. The following scriptures demonstrate how they are often defined in terms of one another: Acts 4:31, Eph 1:13, Eph 6:17, 2 Tim 3:16, 2 Peter 1:21, 1 John 5:7. These verses very clearly show how the Word and the Spirit interact and work in unity with each other. We are not trying to get into a theological discussion of the distinction between the use of logos (often referred to as the written word) and rhema (often referred to as the spoke or breathed word) in the Greek. We don’t want to make this distinction since they very much interact, intertwine and cannot be separated. That is not to say that there are not some nuances between the use of logos, rhema and Spirit. For the purposes of our use, we want to say that you can’t separate the Word from the Spirit and neither can you separate the established Word of God from the Living Word that a believer experiences in their relationship with God. Where are we going with this? Well again, not trying to focus too theologically in-depth, let’s examine one use of these words in Greek from John 6:63, 68. Here Jesus declares that the rhema words He is speaking to His disciples are spirit (pneuma) and life (zoe). Here His rhema words impart the essence, character, and nature of Himself as the real food and drink to His disciples. How did He know to declare this? In John 1:1-3, He is the Word (logos) and the Word was with God and the Word was God (logos) – His identity as the Word (logos) and all that He says and does (rhema) is through the Father in order to reveal the Father to the world around Him by the Spirit of God! This is a divine interplay between He and His Father, who are One. In other words, God the Son as the logos Word, defines, explains and expresses the Father’s heart and thoughts towards man. God the Spirit (pneuma) as the breath, carries the rhema Word to the people and applies God’s essence and power to them. Or in laymen’s terms, because the Spirit of God dwells in us, we are able to hear God’s voice, see through His eyes, and speak His heart through prophecy, while demonstrating His power through agape love for the people around us. We can stand in confidence on the strongest foundation possible “a spoken word, based on the written Word.” The fire and power of a true rhema word must burn from the ignition of a logos word! The written and spoken word creates faith and transforms lives, but we need to put some action to it. When we know who we are based on His Word and His Spirit living in us, then we can release the kingdom of God! 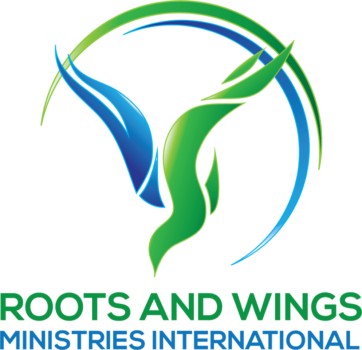 Our passion as Roots and Wings Ministries is to demonstrate this to the Body of Christ so that they, in turn, can demonstrate and prove the perfect will of God to others!